A new exhibition is looking for a little backing, as Worth seeks to showcase portraits and images cut into bank notes, with the project highlighting areas in which women are still underrepresented or discriminated against, and celebrates the women working in these fields, campaigning for gender equality. The exhibition from artist Lady Kitt is immensely relevant and inventive, and is seeking to go from strength to strength. There are various rewards on offer for contributing, including studio visits, bespoke portraits and actual works from the exhibition. 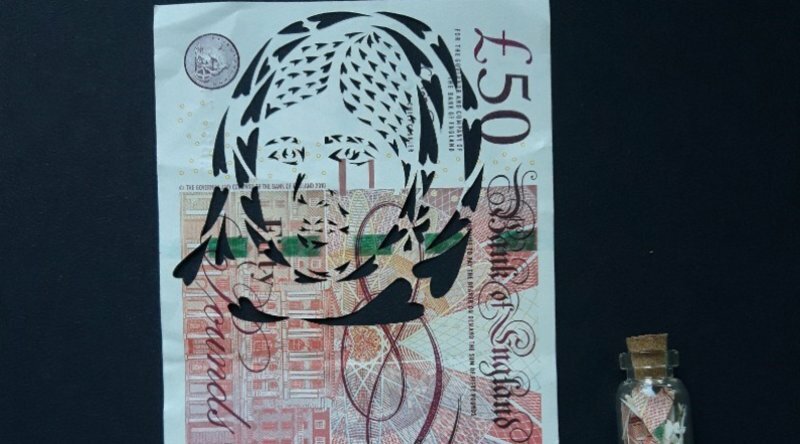 The hand cut, paper cuts are made by cutting multiple love heart shapes from genuine Bank Of England issued £50 notes, with each one depicting a woman who deserves to be celebrated. Aside from the notes being of value, this is an expensive project, and that’s where you come in. Getting one of these rewards and donating is a chance to be a part of a hugely captivating and thought-provoking project. You can find out more and donate here.